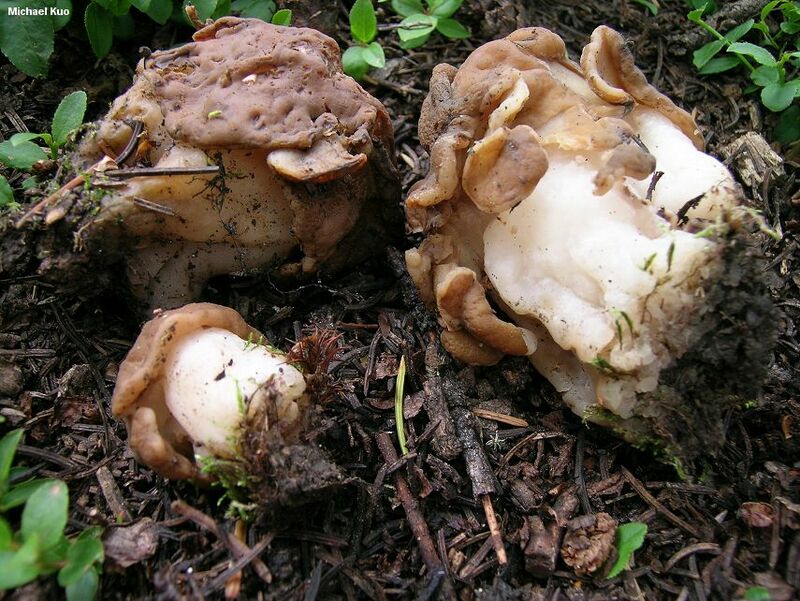 This species of Gyromitra is found in the spring from the Rocky Mountains westward. It has a stout, massive stem, and a tan to golden brown to brown cap. It is extremely difficult to distinguish from the Midwestern and eastern species Gyromitra korfii on the basis of field characteristics--although the two mushrooms apparently grow in different places--and a microscope is probably required to distinguish the two with certainty. The good news is, both Gyromitra montana and Gyromitra korfii should be called Gyromitra gigas, according to the most current mycological treatment; see below for the gory details. I have collected Gyromitra montana only once, in August, when it was the last thing I expected to see. However, I was collecting at 11,000 feet in the Rocky Mountains, and if I had been there a few weeks earlier I would have been collecting between patches of melting snow; "spring" comes late at high elevations. My specimens were scattered around the bases of dead but still standing Engelmann spruce trees--reminiscent of the fruiting pattern of Gyromitra korfii, which is often found near dead hardwoods, and yellow morels that appear near dead or dying elms. Officially, Gyromitra gigas is the correct current name for this species, since Abbott & Currah (1997) synonymized Gyromitra korfii and Gyromitra montana with Gyromitra gigas, and a more recent treatment does not exist. Abbott & Currah examined the spores of a gazillion putative Gyromitra montana specimens from the northern Rocky Mountains, together with spores of a North Carolina type collection of Gyromitra korfii and spores of three Scandinavian collections labelled Gyromitra gigas. The authors found that sporal "features overlap," and that "[t]hese taxa should be accepted as conspecific with a rather broad range of ascospore morphology" (23). Since Gyromitra gigas is the oldest species name among the three, it wins, according to the rules that govern botanical names. A DNA study of this species group has not been published. Ecology: Officially saprobic, but potentially also mycorrhizal--or, like the true morels, donning both ecological hats in the course of its life cycle; found under conifers in spring, often near melting snowbanks; from the Rocky Mountains westward. Cap: 3-14 cm high; 2-9 cm wide; compact and tightly affixed; loosely wrinkled; bald; sometimes somewhat convoluted or nearly lobed; tan to yellow brown, rarely with red shades; undersurface whitish to tan, bald or finely dusted, ingrown with the stem where contact occurs. Stem: 2-10 cm high; 2-6 cm wide; pale tan to white; massive; bald; sometimes developing broad ribs. 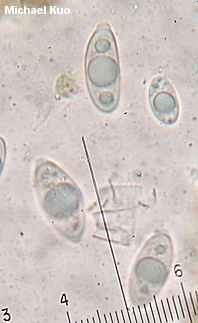 Microscopic Features: Spores 26-40 x 11.5-15 µ; ellipsoid; often developing short, blunt apiculi up to 1-3 µ long and about 3 µ wide--but frequently not developing apiculi, or developing less conspicuous apiculi. Asci 8-spored. Paraphyses clavate; up to 10 µ wide; with brownish contents. REFERENCES: Harmaja, 1973. (Harmaja, 1973; Smith, 1975; Smith, Smith & Weber, 1981; Arora, 1986; States, 1990; Phillips, 1991/2005; Lincoff, 1992; Weber, 1995; Abbott & Currah, 1997; Evenson, 1997; Kuo, 2005; Miller & Miller, 2006; Trudell & Ammirati, 2009.) Herb. EIU ASM 2461. Herb. Kuo 08080504. This website contains no information about the edibility or toxicity of mushrooms.